Nicholas James Adenhart (August 24, 1986 – April 9, 2009) was an American right-handed baseball starting pitcher who played two seasons in Major League Baseball (MLB) for the Los Angeles Angels of Anaheim. In four career games, Adenhart pitched 18 innings and posted a win-loss record of 1–0, with nine strikeouts and a 6.00 earned run average (ERA). A graduate of Williamsport High School, Adenhart was highly touted as a high school prospect until an injury in his final game required Tommy John surgery. He was drafted by the Angels in the 14th round of the 2004 Major League Baseball draft, and began playing in their minor league system after the surgery was a success. He spent three full seasons in the minor leagues before making his major league debut on May 1, 2008. After appearing in three games, Adenhart spent the rest of 2008 in the minor leagues developing his skills, and in 2009 he earned a spot in the Angels' starting rotation. Just after pitching his first start of 2009, Adenhart was killed in a collision with a drunk driver. Both the Angels and the Salt Lake Bees, for whom Adenhart played in 2008, suspended their next games. There were many tributes to him over the course of the season, including his former teammates celebrating with him by spraying champagne and beer on one of his jerseys after they clinched the 2009 American League West division championship. Nicholas James Adenhart was born in Silver Spring, Maryland, the only son of Janet and Jim Adenhart, a former United States Secret Service officer. His parents divorced and Janet later remarried Duane Gigeous, with whom she had a son named Henry, who is a pitcher at the University of Oregon. Adenhart played Halfway Little League Baseball for Gehr Construction and attended Springfield Middle School in Williamsport, Maryland. He pitched for the Hagerstown PONY League for six years, and was a member of the 1999 team that won the Maryland District 1 title. After graduating from middle school, Adenhart attended Saint Maria Goretti High School in Hagerstown, Maryland. He played shortstop and outfield, in addition to pitching. While attending Saint Maria Goretti, Adenhart was a guard on the basketball team that won the Baltimore Catholic League championship. At the age of 14, Adenhart joined the Oriolelanders, a showcase team composed of Maryland amateur players and sponsored by the Baltimore Orioles, where he would stay for four years. In 2003, at the age of 16, Adenhart pitched for the Youse's Maryland Orioles, who went on to win the All American Amateur Baseball Association Tournament for that year. Adenhart transferred to Williamsport High School after his sophomore year, where he gave up basketball to focus solely on baseball, as a pitcher. Scouts began closely following him when he was named the top junior prospect by Baseball America. Adenhart had a 6–0 record with a 1.04 earned run average during the regular season in his junior year, and as a result was named the Gatorade Player of the Year in Maryland. In a 1–0 loss during the playoff quarterfinal matchup, he threw a no-hitter and had 14 strikeouts. Entering his final high school season, Baseball America dubbed Adenhart the top high school prospect in the country. In his senior year, Adenhart threw a perfect game in his very first outing, striking out 15 of the 21 batters faced. Entering the final regular season game of his high school career, he had a 5–1 record, a 0.73 ERA and an average of 2.2 strikeouts per inning. During November of his senior year, Adenhart signed a letter of intent to play with the North Carolina Tar Heels baseball team at the University of North Carolina, although his chances of being drafted high continued to climb and the North Carolina coaching staff saw their chances of acquiring Adenhart to be slim. In his final high school game, in front of two dozen scouts, Adenhart felt a pop in his elbow after throwing a curveball to the third batter. The injury, which abruptly ended his season, was a partial ligament tear in his elbow that required Tommy John surgery. Though he had originally been projected as a first-round draft pick, the injury caused his stock to plummet two weeks before the 2004 Major League Baseball draft. He fell to the 413th overall pick in the 14th round, selected by the Anaheim Angels. Angels scout Dan Radcliff and director of scouting Eddie Bane convinced Adenhart to forego a scholarship offer from the University of North Carolina and signed him to a $710,000 bonus ($820,000 in 2010) on July 26, 2004. After having Dr. James Andrews perform the Tommy John surgery, Adenhart spent the next year rehabilitating his elbow at the Angels' rehab facility in Tempe, Arizona. During that time, Adenhart also attended classes at Arizona State University. Adenhart made his professional debut on June 25, 2005 with the Pioneer League's Orem Owlz, the Angels' Rookie League affiliate. In his lone appearance for the Owlz, he pitched six innings, allowed one unearned run, struck out seven, and earned the win. He spent the rest of the 2005 season with the Angels of the Arizona League that summer. In 13 games for the Angels, he had a 2–3 record, a 3.68 ERA, and 52 strikeouts. The following spring, at the age of 19, Adenhart was one of twelve pitchers who earned a non-roster invitation to the Angels' big league camp. As the 2006 season began, he was also considered the Angels' sixth best prospect and the 90th-best overall by Baseball America. Adenhart was assigned to the Cedar Rapids Kernels, the Angels' Low-A affiliate, after spring training. He pitched well for the Kernels. In 16 games, Adenhart had 10 wins, a 1.95 ERA, and 99 strikeouts in 106 innings pitched. His performance earned him a starting assignment in the 2006 All-Star Futures Game on June 21 and a promotion to the Rancho Cucamonga Quakes, the organization's High-A affiliate, soon after. He continued his efforts with the Quakes, winning five games and losing two in nine starts. Adenhart was a member of the United States Olympic Qualifying team in 2006, along with fellow Angels prospect Brandon Wood. In 2007, Adenhart became a top-ranked prospect in the Angels organization. Baseball America ranked him as the 34th-best prospect in baseball and second in the Angels organization. He was called up to the Double-A Arkansas Travelers for which he played the 2007 season. In 26 appearances, he had a record of 10–8 with a 3.65 ERA. 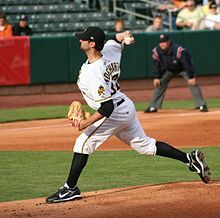 The following year, Adenhart was called up to the Triple-A Salt Lake Bees, where he spent the majority of the 2008 season. He was declared the 24th-best prospect in the majors that season. In the month of April, Adenhart had a 4–0 record with a 0.87 ERA and 21 strikeouts in 31 innings. As a result, he was brought up to the Angels' major league roster, and was scheduled to make his debut on May 1, pitching on three days' rest. Shortstop Maicer Izturis was placed on the disabled list when Adenhart was brought up. "I got called up, and I was realizing a dream. I felt like I had to not give up any runs and throw a shutout every time out and wow everybody. I put pressure on myself. That was enough of that. I'm just having fun now." —Nick Adenhart reflecting on the 2008 season, Baseball America, April 6, 2009. Adenhart made his Major League debut as the starting pitcher against the Oakland Athletics at home in Angel Stadium of Anaheim. At the time, he was the youngest active-roster pitcher in the major leagues. In his debut, he gave up five earned runs and walked five in two innings, earning a no-decision in a 15–8 loss. Adenhart was disappointed in his first appearance, saying, "I let down the team first. You always want to go out and prove yourself to your teammates and your manager and your coaches. I was a disappointment to myself also." His second start was against the Kansas City Royals, where he earned another no-decision, allowing three earned runs and striking out three over 4⅓ innings in a 5–3 win by the Angels. The reaction to his second start was more positive, with manager Mike Scioscia saying that "it was definitely a start in the right direction." Adenhart earned his only career decision, a victory, on May 12, 2008, against the Chicago White Sox in Anaheim, giving up four earned runs in 5⅔ innings en route to a 10–7 Angels victory. After the win against the White Sox, Adenhart was sent back down to the Salt Lake Bees. He spent the rest of the 2008 season at Salt Lake, amassing a 9–13 record with a 5.76 ERA in 26 games. Adenhart was declared the best prospect in the Angels organization going into 2009, and was ranked 68th overall on Baseball America's 2009 Top 100 Prospects list, citing his 158 innings pitched per year over the past three seasons. Adenhart earned his spot in the Angels' 2009 starting rotation during spring training. He appeared in six starts and had a 3–0 record with a 3.12 ERA over 26 innings pitched. He allowed only nine earned runs and five walks, while striking out 18. Adenhart opened the 2009 season as the third starter in the Angels' rotation. In his season debut on April 8, 2009, he earned a no-decision, giving up seven hits and no runs while striking out five batters and walking three in six innings against the Oakland Athletics at Angel Stadium of Anaheim. Shortly after midnight on April 9, 2009, Adenhart was involved in a car crash in Fullerton, California, just hours after being the starting pitcher in the previous night's game. Police reported that an individual driving a red Toyota Sienna minivan ran a red light and broadsided a gray Mitsubishi Eclipse in which Adenhart was a passenger, sending it crashing into a telephone pole. The driver of the Eclipse, Henry Pearson, and a passenger, Cal State Fullerton cheerleader Courtney Stewart, were pronounced dead at the scene. Adenhart and Jon Wilhite, another passenger in the Mitsubishi, were taken to University of California, Irvine Medical Center, where Adenhart died as a result of his injuries at the age of 22. Wilhite suffered internal decapitation and survived after undergoing five hours of surgery to reattach his skull to his spine six days after the crash. The minivan driver fled the scene on foot, but was later arrested and identified as Andrew Thomas Gallo. On May 27, 2009, Gallo was indicted by the Orange County grand jury on three counts of murder, one count each of felony hit-and-run, driving under the influence and causing injury, and driving with a .08 percent blood alcohol or higher and causing injury and death. Gallo had a blood alcohol content of .19 percent two hours after the crash, and was also driving with a suspended license. On June 8, 2009, Gallo entered a not guilty plea at his arraignment. After a two-week jury trial held in September 2010, Gallo was convicted on three counts of second-degree murder, two counts of driving under the influence causing great bodily injury, and one felony count of hit-and-run. A bench trial found Gallo guilty of driving on a suspended license. On December 22, 2010, Gallo was sentenced to 51 years to life in jail. Nick's family expresses sincere gratitude for all the help the Angels have provided. He lived his dream and was blessed to be part of an organization comprised of such warm, caring, and compassionate people. The Angels were his extended family. Thanks to all of Nick's loyal supporters and fans throughout his career. He will always be in everyone's hearts forever. The Angels family has suffered a tremendous loss today. We are deeply saddened and shocked by this tragic loss. Our thoughts and prayers go out to Nick's family, friends, loved ones and fans. The Angels postponed the game against the Athletics for the day immediately after Adenhart's death. In remembrance of Adenhart, for the rest of the 2009 season, a black number 34 patch was placed above the heart on the Angels' uniforms, his locker in the Angel Stadium of Anaheim clubhouse remained as it was, and a locker was assigned to him on road games. 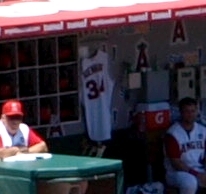 The team hung one of Adenhart's jerseys in their dugout during games. A black-and-white photo of Adenhart along with his name and number was added to the center field fence at Angel Stadium. A makeshift shrine, dedicated to Adenhart, was established outside the home plate gates to Angel Stadium. The makeshift shrine was maintained by Angels personnel until its removal in December 2009. The Angels do not have any plans to create a permanent memorial. The Salt Lake Bees, the Angels' AAA affiliate, also postponed their game on April 9 against the Reno Aces. The team also wore a number 32 patch through the season representing Adenhart's jersey number during his time with the Bees. A number 32 was also painted on the grass in front of the Bees dugout. On September 28, 2009, when the Angels celebrated winning the American League West division, they honored Adenhart by spraying champagne and beer on one of his jerseys, and then gathered in front of the outfield wall memorial for a team picture. The appropriateness of celebrating with alcohol in respect to Adenhart's death being alcohol-related was questioned, but family members were supportive of the celebrations. Adenhart's father Jim stated, "That's baseball. If Nick were there, he'd have been throwing a few back as well." Adenhart's teammates voted to give his family a full playoff share for the 2009 playoffs worth $138,038.57. Angels manager Mike Scioscia dedicated his 2009 American League Manager of the Year Award to Adenhart. The Angels established the Nick Adenhart Pitcher of the Year award given to an Angels pitcher for outstanding performance throughout the regular season. The team commissioned Harry Weber to create a bronze statue of Adenhart, which will be on display in the Angel Stadium trophy case. Smaller versions of the statue will be presented to all honorees of the Nick Adenhart award. The Adenhart family created the Nick Adenhart Memorial Fund, which is designed to provide financial support to youth baseball organizations. The goal is to lend a helping hand to struggling leagues around the country to buy equipment and cover expenses to keep youth baseball functioning. The first presentation from the fund was for $5000 to the Halfway Little League in Halfway, Maryland. Two annual events, the Nick Adenhart 5K Run and Walk and the Nick Adenhart Baseball Camp, have been established to benefit the foundation. Adenhart's number 21 jersey was retired by the Cedar Rapids Kernels, the Angels' Class A affiliate, on June 20, 2010. The Kernels, the Kernels Foundation, and the Adenhart family also established the Nick Adenhart Memorial Scholarship, a yearly $1,000 scholarship. The Orem Owlz, for whom Adenhart briefly played in 2005, have worn special jerseys, which bear the likeness of a screen-printed picture of Adenhart, along with his number 34. The Little League Baseball field where Adenhart played in Halfway, Maryland, was rededicated as the Nicholas James Adenhart Memorial Field. The Hagerstown Suns, the Minor League Baseball affiliate in Hagerstown, Maryland, held a fundraiser for the Nick Adenhart Memorial Fund and added Adenhart to their Wall of Fame at Municipal Stadium. The city of Manhattan Beach, Wilhite's home town, erected the Pearson-Wilhite-Stewart-Adenhart Commemorative Wall at Marine Avenue Park honoring all four victims of the crash. As a memorial, Angels pitcher Jered Weaver wrote the initials "NA" in the dirt on the back of the pitcher's mound before each start in honor of Adenhart. Weaver also named his son Aden in memory of Adenhart. Mike Napoli, who caught Adenhart's final game, goes out to center field before every game, and writes Adenhart's name in the warning track dirt. Darren O'Day, who came up through the Angels minor system with Adenhart, writes Adenhart's number and initials on the brim of every new cap he wears. Baltimore Orioles pitcher Miguel González paid tribute to Adenhart, his former minor league teammate, by wearing one of his gloves in his first major league start, which was against the Angels on July 6, 2012. Adenhart is buried at Greenlawn Cemetery, in Williamsport, Maryland, just across the street from Springfield Middle School, where he attended and played baseball as a child. A public memorial service was held at Williamsport High School the day after his burial. Subsequent to Adenhart's death, his former high school teammate and close friend, David Warrenfeltz, was hired as the Williamsport High School baseball coach. In a crash described as "eerily similar to Adenhart's", the school's star pitcher and his girlfriend were both killed in a collision in 2012. ^ a b c "Angels pitcher killed in crash". Associated Press. April 10, 2009. Retrieved April 10, 2009. ^ Spencer, Lyle (January 16, 2010). "Younger brother continues Adenhart's legacy". MLB.com. Retrieved January 16, 2010. ^ Smith, Marcia C. (April 13, 2012). "Adenhart crash survivor remembers". The Orange County Register. Retrieved April 14, 2012. ^ a b c d Becker, Michael (April 27, 2009). "Town mourns life cut short". The Press-Enterprise. ^ a b Parasiliti, Bob (July 1, 2009). "Adenhart fund donates $5K to Little League". The Herald-Mail. Retrieved July 13, 2011. ^ a b c Kubatko, Roch (May 8, 2004). "Adenhart is pitching to hit the big leagues". Baltimore Sun. Retrieved September 23, 2009. ^ Walker, Childs (April 9, 2009). "Angels pitcher Nick Adenhart, a Md. native, dies in car accident". Baltimore Sun. Retrieved July 22, 2011. ^ Davidoff, Ken (October 14, 2009). "Davidoff: Angels will ensure Nick Adenhart won't be forgotten". Deseret News. Retrieved July 22, 2011. ^ Mastovich, Mike (April 10, 2009). "AAABA team mourns loss of Angels rookie". The Tribune-Democrat. Archived from the original on August 28, 2009. Retrieved September 24, 2009. ^ a b c Kaufmann, Dan (May 23, 2003). "Adenhart earns Gatorade award". The Herald-Mail. Retrieved July 13, 2011. ^ a b Callis, Jim (July 26, 2004). "Angels Sign Adenhart For $710,000". Baseball America. Retrieved November 16, 2009. ^ a b c Steinberg, Dan (May 29, 2004). "When you get a good kid...it's sad". Washington Post. Retrieved September 24, 2009. ^ Kubatko, Roch (August 1, 2004). "Adenhart worth wait for Angels". Baltimore Sun. Retrieved April 10, 2009. ^ Kline, Chris (May 22, 2006). "Adenhart starring for low Class A Cedar Rapids". Baseball America. Retrieved November 16, 2009. ^ a b c d e f "Nick Adenhart Minor League Statistics & History". Sports Reference, LLC. Retrieved January 18, 2010. ^ Scarr, Mike (February 22, 2006). "Adenhart getting taste of big leagues". MLB.com. Retrieved January 18, 2010. ^ "Baseball America – 2006 Top 100 Prospects: 51–100". Baseball America. February 23, 2006. Retrieved January 19, 2010. ^ "XM Satellite Radio All-Star Futures Game rosters announced" (Press release). Major League Baseball. June 21, 2006. Retrieved February 11, 2010. ^ Shill, Aaron (July 13, 2006). "Future endeavors". The Deseret News. ^ Manuel, John (August 15, 2006). "Butler, Wood Lead U.S. Olympic Qualifying Roster". Baseball America. Retrieved January 19, 2010. ^ "2007 Top 100 Prospects". Baseball America. February 28, 2007. Retrieved January 19, 2010. ^ "Top 100 Prospects: No. 21-40". Baseball America. February 26, 2008. Retrieved January 23, 2010. ^ Hurst, Matt (April 30, 2008). "Angels prospect Adenhart to debut today". The Press-Enterprise. ^ a b c "Cust goes 4-for-4, tags go-ahead homer in A's win". ESPN.com. May 1, 2008. Retrieved July 22, 2009. ^ Shaikin, Bill (April 6, 2009). "Second Chance Coming: Adenhart ready to rebound in big leagues". Baseball America. Retrieved November 16, 2009. ^ Scarr, Mike (May 2, 2008). "Angels struggle in finale". MLB.com. Retrieved April 11, 2009. ^ Parasiliti, Bob (May 7, 2008). "Another no-decision for Adenhart". The Herald-Mail. Retrieved July 13, 2011. ^ Klima, John (May 12, 2008). "Guerrero's big bat comes alive". MLB.com. Retrieved April 11, 2009. ^ Klima, John (May 13, 2008). "Adenhart wins, then gets sent down". MLB.com. Retrieved January 23, 2010. ^ "Top 100 Prospects: No. 61-80". Baseball America. February 24, 2009. Retrieved January 23, 2010. ^ a b c "Angels' Adenhart, two others, killed in automobile accident" (Press release). Major League Baseball. April 9, 2009. Archived from the original on April 12, 2009. Retrieved February 9, 2010. ^ Spencer, Lyle (April 9, 2009). "A's rally off Angels bullpen". MLB.com. Retrieved April 11, 2009. ^ a b Singer, Tom (April 9, 2009). "Angels' Adenhart killed in accident". MLB.com. Retrieved April 9, 2009. ^ a b Goffard, Christopher; Hanley, Christine (April 10, 2009). "For the Angels, a promising young arm arrives – and then is lost". Los Angeles Times. Retrieved April 10, 2009. ^ Giasone, Barbara (July 9, 2009). "How doctors saved Adenhart crash survivor's life". The Orange County Register. Retrieved August 28, 2009. ^ a b Welborn, Larry (May 27, 2009). "Grand jury indicts driver in crash that killed Angels pitcher". The Orange County Register. Retrieved May 28, 2009. ^ Welborn, Larry (June 8, 2009). "Not guilty plea in crash that killed Angels pitcher". The Orange County Register. Retrieved June 8, 2009. ^ Welborn, Larry; Irving, Doug; Hardesty, Greg; Molina, Alejandra (September 28, 2010). "Driver found guilty in Adenhart crash". The Orange County Register. Retrieved September 28, 2010. ^ Flaccus, Gillian (September 25, 2010). "Calif judge renders partial verdict in DUI case". Associated Press. Retrieved September 27, 2010. ^ Welborn, Larry (December 22, 2010). "Driver gets 51 years to life for Adenhart death". The Orange County Register. Retrieved December 22, 2010. ^ Bloom, Barry M. (April 9, 2009). "Adenhart mourned; game postponed". MLB.com. Retrieved January 23, 2010. ^ a b Bollinger, Rhett (April 10, 2009). "Adenhart honored in pregame ceremony". MLB.com. Retrieved April 11, 2009. ^ Curry, Jack (May 2, 2009). "Angels Are Maintaining Adenhart's Presence". The New York Times. Retrieved June 21, 2009. ^ Crowe, Jerry (August 7, 2009). "Shrine to Nick Adenhart continues to grow at Angel Stadium". The Los Angeles Times. Retrieved August 25, 2009. ^ Shaikin, Bill (December 13, 2009). "Angels fans couldn't forget Adenhart". The Los Angeles Times. Retrieved April 3, 2010. ^ a b Bolch, Bill (April 1, 2010). "Angels' Scot Shields looks forward, not back". The Los Angeles Times. Retrieved April 3, 2010. ^ a b c Facer, Dirk (April 10, 2009). "Emotions run high for Salt Lake Bees honoring former teammate". Deseret News. Retrieved October 16, 2009. ^ DiGiovanna, Mike (September 29, 2009). "AL West title is sweet, and bittersweet, for Angels". Los Angeles Times. Retrieved September 29, 2009. ^ Saxon, Mark (September 29, 2009). "Angels' Mead says Adenhart's family appreciative". The Orange County Register. Archived from the original on October 3, 2009. Retrieved October 5, 2009. ^ Spencer, Lyle (November 30, 2009). "Halos share purse with Adenhart's estate". MLB.com. Retrieved November 30, 2009. ^ Rumberg, Howie (January 23, 2010). "A-Rod chokes up when receiving playoffs MVP award". Associated Press. Retrieved January 24, 2010. ^ Quinn, Roberts (June 21, 2009). "Halos create Adenhart, Gomez awards". MLB.com. Retrieved June 22, 2009. ^ DiGiovanna, Mike (March 5, 2010). "Statues of Nick Adenhart, Preston Gomez stir players' emotions". Los Angeles Times. Retrieved March 6, 2010. ^ Parasiliti, Bob (May 8, 2009). "Nick Adenhart's family starts memorial fund". The Herald-Mail. Retrieved July 13, 2011. ^ Gilbert, Marie (June 12, 2010). "Benefit run honors late Angels pitcher Adenhart". The Herald-Mail. Retrieved July 13, 2011. ^ Plunkett, Bill (July 23, 2011). "Wilson helps keep Adenhart's memory alive". The Orange County Register. Retrieved July 23, 2011. ^ Sears, John (June 20, 2010). "Kernels honor Adenhart then crush Burlington". KCRG News. Archived from the original on September 28, 2011. Retrieved June 20, 2010. ^ "Cedar Rapids Kernels pay tribute to former player, Nick Adenhart". The Gazette. July 7, 2011. Retrieved July 13, 2011. ^ Franchuk, Jason (July 2, 2011). "Owlz bounce back, top Raptors to re-claim 1st place". The Daily Herald. Retrieved July 21, 2011. ^ McMillion, Dave (August 23, 2009). "Adenhart's memory honored at Halfway LL". The Herald-Mail. Retrieved July 13, 2011. ^ Parasiliti, Bob (August 16, 2011). "Suns honor Adenhart at Municipal Stadium". The Herald-Mail. Retrieved September 16, 2011. ^ Agostoni, Kristin (December 17, 2011). "Manhattan Beach monument recalls tragic loss". Daily Breeze. Archived from the original on January 9, 2012. Retrieved December 27, 2011. ^ Kruth, Cash (February 11, 2012). "Adenhart, fellow accident victims honored". MLB.com. Retrieved February 11, 2012. ^ Grossberg, Josh (February 11, 2012). "DUI crash victims, including Angels pitcher Adenhart, recalled at Manhattan Beach monument". Daily Breeze. Archived from the original on February 14, 2012. Retrieved February 21, 2012. ^ Saxon, Mark (July 12, 2011). "Jered Weaver, all grown up". espn.go.com. Retrieved July 21, 2011. ^ Brown, Tim (July 5, 2013). "Jered Weaver honors late Angels pitcher Nick Adenhart by naming first son after him". Yahoo! Sports. Retrieved July 5, 2013. ^ Watkins, Calvin (July 9, 2011). "Baseball shaped by memories". espn.go.com. Retrieved July 21, 2011. ^ Shaikin, Bill (July 14, 2015). "All-Star reliever Darren O'Day is still paying tribute to Nick Adenhart". The Los Angeles Times. Retrieved July 19, 2015. ^ "Orioles' Miguel Gonzalez honors late friend Nick Adenhart in 1st win". ESPN.com. Associated Press. July 6, 2012. Retrieved March 6, 2013. ^ Sanchez, Jesse (April 17, 2009). "Thousands gather for Adenhart funeral". MLB.com. Archived from the original on November 7, 2014. Retrieved May 9, 2015. ^ McMillion, Dave (May 6, 2012). "Two Williamsport High School athletes killed in wreck on Rench Road". The Herald-Mail. Retrieved April 23, 2013. ^ McMillion, Dave (May 7, 2012). "Williamsport teens' deaths 'eerily similar' to Adenhart's, coach says". The Herald-Mail. Retrieved April 23, 2013. ^ Ballard, Chris (2011). "Mourning Glory". Sports Illustrated. 117 (16): 57–68. Bibcode:2011Natur.471..143T. doi:10.1038/471143a. Retrieved April 23, 2013. Wikimedia Commons has media related to Nick Adenhart. This page was last edited on 28 March 2019, at 18:30 (UTC).